Playing sports growing up I was never the best athlete out there. I was never the biggest, fastest, strongest, flashiest or most skilled. Success in sports never came naturally, or easily to me. I became used to having to be the hardest working player, became used to having to scratch and claw to earn playing time and became used to having to rely on toughness more than talent to survive and thrive in years of contact sports. Looking back on it, I wouldn’t have had it any other way. I have never been one to brag, nor have I cared much for individual accolades. However, in order for me to paint a picture of how dealing with a concussion is like no other injury I feel there is a certain necessity for such. Playing high level hockey, lacrosse, rugby and football meant taking and receiving a lot of hits. Despite regularly being the smallest player on the field/floor this was by far my favourite part. The bigger the opponent, the more inclined I was to try to knock them down regardless of what the expected outcome would be. I had my most successful years in sports while playing linebacker at McMaster University. Despite being about 50 pounds lighter and half a foot shorter than a prototypical linebacker I was able to thrive based on physicality. I was part of a National Championship Winning team, played in two other national championship games and won 3 separate Ontario Championships along the way. I was lucky enough to be named a captain, All Star, Academic All- Canadian and Defensive MVP as a student athlete along the way. When I received the MVP award my coach started out the speech by saying I was receiving it because I was the toughest ‘pound for pound’ player he’d ever coached. That team was full of future CFL draft picks and all stars and yet I was unanimously voted for the award. Yet again I was able to get by based on effort, tenacity and toughness. It was around that time that I began to realize I might be good enough to play football at the next level. A year or two later, near the end of my university career I was being contacted by pro scouts and had been invited to the CFL combine for graduating players looking to make the leap to the professional ranks. Unfortunately, I now sit on the couch watching my former teammates play in the CFL instead of lining up against them. My decision to try to be tough and play through concussions put an abrupt and unexpected end to my football career. Up until 2012 I never let the fact that I was the little guy on the field make me feel small. That feeling was reserved for people who couldn’t take a hit, couldn’t bounce back up and couldn’t deal with the pain and physical nature of contact sports. I worked too hard to put myself in a position to succeed to ever feel small. At least that was true until 2012 when I suffered several severe concussions that made me realize just how small I could feel. I was sitting on my bed with the lights off and the blinds closed in my second year student house when I started to realize that I wasn’t dealing with just any ordinary injury. I had just woken up from what must have been my fourth nap of the day, something I became accustomed to since the 5 minutes after waking up was the only time I felt normal all day. The exact day, week and month are blurry but I remember the feeling like it was yesterday: panic. I had dealt with countless injuries before and had always made speedy recoveries. Why was I not getting better, why was this injury any different? These consequences were a result of playing through numerous games leading up to the national championship in late November with a concussion. I hid my injury from my team trainers, coaches and doctors. The initial injury was not a result of a huge collision and therefore no one else knew I was injured. My thought was that I could rest for a few weeks afterwards then be back in the gym for the first month of offseason training in January. I thought I would play through it and recover just like I did with any other injury. Oh, how wrong I was. Flash forward about 4 months after the championship game when I started getting desperate. I was still too proud to admit I wasn’t healthy. It wasn’t until an attempt at late night studying where I hit my rock bottom. I would read a page in a book and by the time I got to the bottom of it I had already forgotten everything I had just read. I remember that night vividly because it was the first time I felt entirely hopeless and the first time I felt completely out of control of my emotions. I didn’t know what to do or who to turn to. I felt so alone, so very depressed and frankly, so afraid. That was a really long night, maybe one of the longest of my life. For a total of 9 months after my diagnosis I struggled with academics. I was unable to workout with my teammates and at times I struggled to hold conversations. I made the mistake of not looking for outside help because I was too proud and thought this condition was me just being weak. If I could go back in time, I would have spent these days and months so differently. I would have opened up about how I was suffering. I would have found help from professionals and I would not have tried to fight the battle by myself. That is not to say help wasn’t available, I had every resource from trainers, coaches, doctors and neurosurgeons I could have turned to. I just chose to ignore it all and it made things much worse during that time. I just thought that what was happening made me weak. Midway through the summer I was lucky enough to be cleared by doctors and for the next two and a half years was able to get back to the sport I loved. My grades rebounded and in general it looked like my issues with concussions were a thing of the past. It took a long time, but I started feeling like my usual self and I was able to move on with my life. Unfortunately, my competitive spirit resulted in me making further poor decisions and not learning my lesson. 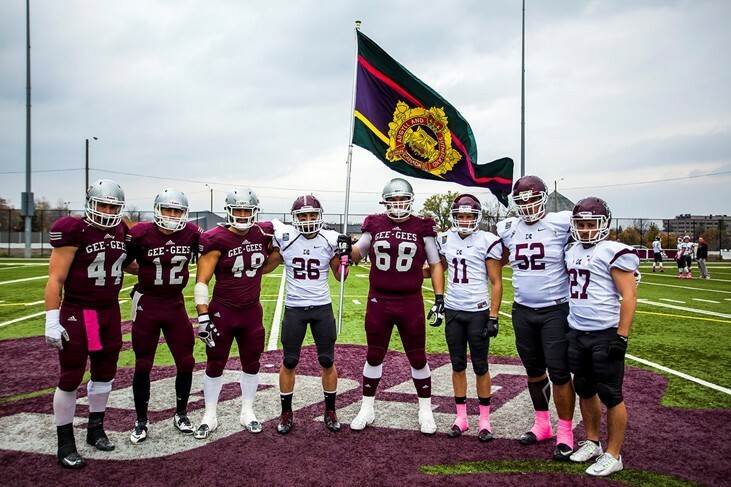 It was my 5th and final year of McMaster football. I had graduated with honours in the spring, decided to postpone my career search and was ready for one last year wearing the Maroon and Grey jersey. Unfortunately, in our first playoff game I suffered another bad concussion and knew it immediately. No one saw the hit however, no one asked if I was fine or thought there was a chance I was not ready to continue playing. As a team captain, all-star and senior who was potentially playing in my last ever game in a Maroon and Grey Marauder jersey, I felt like I couldn’t let my team down. If my athletic therapist or team doctor found out I was concussed it would have ended my season and I feared sitting on the sidelines, watching my team’s season end. So, I played through it again, and every game afterwards I got so much worse. Despite my terrible experience in 2012 still fresh in my mind I still decided to hide my symptoms. It’s still a decision I think about to this day. I let my competitive drive win over common sense. The resulting post-concussion syndrome resulted in much worse consequences than back in 2012. We made it all the way to the National Championship game and I now look back at that game and know my resulting poor performance let my team down. This happened in a game where we lost by 1 point in heartbreaking fashion. There were a handful of plays I was not making that I regularly would have and I know they could have swung the balance of the game. As an athlete I am my own biggest critic and unfortunately time does not heal all wounds, I still feel like I let my team down. That’s not to mention the fact that it took me years to feel like myself again and that I had to abandon any pursuit of the CFL because my team doctor and trainer, rightly so, would not medically clear me. Having to reply ‘No’ to my only shot at professional sports stung. A LOT. It was the right decision, but it is something I would not have had to do if I was smarter with my injuries. Every kid growing up dreams of playing professional sports and I was no different. If only a younger version of me realized taking care of my body was one of the most important aspects of this dream than I might not be writing this story down. I may still be strapping on the pads today if I treated my head injuries better. More than that, I was barely able to start a working career due to sustained symptoms over the following year. At the end of the day, I made the decision to play and I can’t go back on it. I dealt with post concussion syndrome for a very long time but can now say that I believe I am back to normal. I am lucky to be able to say that because some people never fully recover. If I could go back in time I would not quit football or avoid contact sports. Rather, I would have sought help when I was suffering and sat out when I knew I had a concussion. Hiding a concussion is not the tough thing to do. It just isn’t. My life would be so different if I had been honest with myself when I wasn’t healthy. McMaster has one of the best Sports Medicine teams in all of Canada. I should have gone to the experts to take care of me, because they would have done a much better job than I did. Being tough isn’t about playing through head injuries. That’s just being dumb. Toughness and head injuries do not belong in the same sentence. I am lucky enough to now be healthy and to be working with the Concussion Legacy Foundation Canada. I hope to use my negative experience so that someone will listen and not make the same mistakes I did. We need to speak up, it’s as simple as that. Whether it’s about your own head injury or a teammate’s. Competitiveness will always make that a hard decision to do, but sports are only a small chapter in our lives. Brain health is much, much more important. Playing sports helped shape me into the person I am today, and for that reason I will never regret playing them. But I will never again think it is tough to play througha head injury. I just hope we can all come to that same realization.